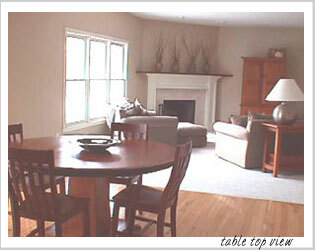 A customer in Indianapolis, Indiana had been looking for the "right" table for almost 5 years. She found it at Kate Madison. Kate Madison worked with her to understand her space requirements, make decisions on the size of the table, the color and the styling. The result was a happy customer. She sent us these photos of the table in her home to share with other customers. Kate Madison thinks the table works beautifully with her decor, and we're so glad she sent along photos. The table visually "joined" the two rooms merging the kitchen and living area. The round table design created a fluid and useful area between the rooms. "We really liked the tapered, block styling of the pedestal base on the table," she said. "It looks modern, yet has a traditional feel. This is a design that I couldn't find at other stores. Our home is a contemporary design, we have decorated with a urban-country feel. I like to blend things that are new and old in character. The addition of well-designed country furniture adds grace to the home." 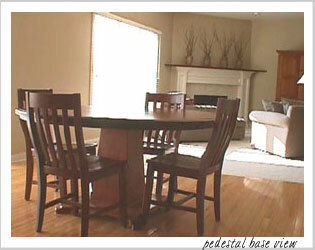 The Pedestal Table is a great way to seat a group without having encumbering legs and space issues. This 60" round table is finished in a Red Oak stain then varnished. The table is top is slightly distressed to give the wood additional character. This table can seat seat 4-8 persons. "We were very surprised when the table arrived, it was more substantial than we originally thought. It definitely surpassed our expectations. The scale and craftmanship of the piece is really wonderful." Urban Country is a new dramatic look that is increasingly popular in home decor. Kate Madison styles feature classically detailed furniture with an antiqued country feel. Each item is constructed with a unique style and character.